Acadian Genealogy Homepage; Madawaskans are Briton and Normans! Madawaskans are Breton and Normans, at the same time? The people of Madawaska, are Bretons and Normans at the same time! The Acadian families which settled the St. John Valley came from the west of France, some from the Province of Poitou, others from Saintonge, but they came principally from Brittany, whereas the Canadian families came from Normandy and Picardy, others from the Province of Maine in France, and still others from the Isle-de-France and other northern provinces. The Canadian families settled on the Bay of Fundy and on the shores of the St. Lawrence. The two groups, the Acadians and the Canadians, separated by a different political organization and under a different administration, became isolated to such an extent that, although of the same origin, they are two different people. However, in Madawaska, after more than a century, the original difference was less marked on account of inter-marriage, inter-relationship, and constant contact, and this difference made the real Madawaskan who is Breton and Norman at the same time, stubborn and smart, honest and gay, active and intelligent, generous and full of initiative, hospital but misunderstood. The long separation of the two groups caused the Acadians and Canadians of the same origin to became indifferent to one another. There has not been to this day, any sign of a compromise or a close relationship between the two groups, in spite of inter-marriage and same names. The Canadian has always taken the cold attitude of the Acadians as unfriendly, when all he wanted was to live his own life; having been on his own initiative for a long time, he became indifferent to the other group. Compelled to forget his real nationality, the Madawaskan has ever answered, as did the old farmer of St. Basile to a lovable and polite, but too inquisitive Frenchman from France: "I am a Madawaskan", with the same boast as the old Roman who used to say: "I am a Roman"; or like the gentleman from London who declared: "I am a British subject". Most of the Acadian families can find the names of their ancestors in the Acadian census taken in 1671 by Hubert de Grandfontaine. These families came to Acadia in 1632 with Commander de Razilly. The families which came later to Acadia from France, have also representatives in Madawaska and can find their names in later Acadian census. 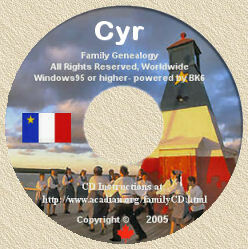 Several names are Acadian and Canadian, such as: Dupuis, Morin, Pelerin, Lajoie, Savoie and Bertrand: it is difficult to tell whether these families came from Acadian or Quebec. Some Canadian families that had crossed over to Acadia before 1783, were found in the midst of eventful conflicts which took place before the settlement of Madawaska. Such families had the name of: Ayotte, Bourgoin, Sanfacon, Duperry, Lizotte, Fournier and Michaud. Canadian and Acadian histories used in the schools, set 1710 as the year during which French rule came to an end in Acadia. But France had never taken a greater interest in Acadia than after the fall of Port Royal. Immediately after the signing of the Utrecht Treaty, France began to strengthen Cape Breton Island, where the Louisburg Fort was built at a cost of $5,000,000. France took an active interest in the colonization of Prince Edward Island, New Brunswick and half of the State of Maine as far down as the Kennebec Valley. The French called this territory French Acadia as opposed to the English Acadia of Nova Scotia. Nevertheless, the English claimed all this French territory, except Prince Edward Island and Port Royal. The Acadians to the north of the Bay of Fundy refused to take the oath of allegiance to the British crown, claiming that they were in French territory. The Acadians of Nova Scotia were under English rule and as such took the oath on condition that they would not be compelled to the fight against the French and the Indians. This is the same oath that they took under Governor Phillips in 1730 and from that date, they became known as French Neutrals. As soon as the Treaty of Utrecht had been signed, the Governor of Louisburg and Quebec, pleaded with the Acadians under English rule, to leave Nova Scotia and come into French territory at Louisburg, Quebec, Prince Edward Island, or in the St. John Valley. They had the right to leave and many heeded the invitation of the French governors, but the English governors did not want a mass emigration, as they needed the Acadians to reinforce Port Royal. The fate of the Acadians became more and more uncertain. They were held under suspicion every time the French, the Canadians, or the Indians tried to reconquer their lost colony. However, from 1730, under the wise administration of unbiased governors, peace was assured and the colony prospered. After the founding of Halifax, hardships began again to afflict the Acadians on the part of Governor Cornwallis, who asked the Acadians to take unconditionally the oath of allegiance to His Majesty King George II, who has just ascended the throne of England. War between England and France was in the offing. At Halifax, the English were filled with anxiety and were already beginning to entertain the plot of expelling the Acadians, which the English governors had planned a long time before. Cornwallis claimed that the oath taken under Governor Phillips, was not valid and that a governor could not attempt anyone from bearing arms against the enemies of England. The Acadians maintained that the oath under Phillips was valid and that it would be inhuman to force them to take another (oath) which would compel them to fight against brethren. Here is the oath they were asked to take: "I promise and I swear with Christian Faith, that I shall be faithful and shall obey His Majesty George II whom I recognize as Sovereign Lord of Acadia or Nova Scotia, so help me God". As Governor Cornwallis threatened the Acadians with the confiscation of all their goods if they refused to take the oath, they asked permission to leave the Province. The Governor dissuaded them by saying that if they did leave, he would be obliged to confiscate all their property. The oath was not taken and, for the moment, no change took place.